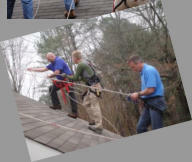 The Rope & Harness class offers you work safety and a skill for your resume that few adjusters have. SUCCESSFUL COMPLETION OF ROOF PRACTICAL required to receive a certificate of completion for the course. Safely accessing and inspecting is a physical activity which requires a certain level of physical fitness by the adjuster. This is the only class offered by an Educational Institution on the East Coast. This course is a must for adjusters who want to maximize their deployment potential and be the safest adjuster possible. The course follows the standards on work positioning set by the Society of Professional Rope Access Technicians (SPRAT) in their Safe Practices for Rope Access Work and recommended in The North American Working at Height Handbook. 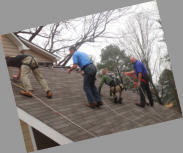 We meet or exceed OSHA standards. This class is taught on a 10/12 slope with a variety of climbing equipment that allows the student to determine which tools suit them the best before they have to purchase any gear. Students learn safety, anchoring techniques, important knots, types and sizes of professional ropes, carabiners, ascenders, and harnesses. Our training is a full day of safety and hands on practical experience for only $300. A certificate of completion is awarded for the class. SUCCESSFUL COMPLETION OF ROOF PRACTICAL required to receive a certificate of completion for the course. Safely accessing and inspecting is a physical activity which requires a certain level of physical fitness by the adjuster.